William Morrow Paperbacks, 9780062273451, 400pp. A daring young woman will risk her life to find her destiny in this atmospheric, beautifully drawn historical debut novel—a tale of love, hope, and danger set during the First World War. Assigned to a field hospital in France, Lilly is reunited with Robert Fraser, her dear brother Edward’s best friend. The handsome Scottish surgeon has always encouraged Lilly’s dreams. She doesn’t care that Robbie grew up in poverty—she yearns for their friendly affection to become something more. Lily is the most beautiful—and forbidden—woman Robbie has ever known. Fearful for her life, he’s determined to keep her safe, even if it means breaking her heart. In a world divided by class, filled with uncertainty and death, can their hope for love survive. . . or will it become another casualty of this tragic war? The paperback includes a P.S. section with additional insights from the author, background material, suggestions for further reading, and more. 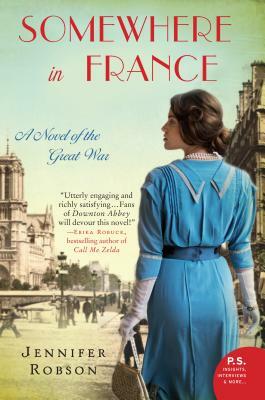 Set in the turbulent years of the first world war, Somewhere in France is a heartfelt portrait of love, courage, and self-discovery. Robson deftly weaves a tale richly steeped in the atmosphere, drama and heroism of an evolving and war-torn world. A compelling and memorable read.